Mayor Wilda Diaz (center, holding book) is shown with current BID directors including Chairman Barry Rosengarten (front row, left) and Vice Chairman Sergio Diaz (front row, right). BID Directors who helped organize the Taste of Perth Amboy 2018, Xtreme Jeep Show and many more events. The BID’s directors present events and programs, and they are assisted by volunteers as well as the city’s police, fire, recreation and public works departments. 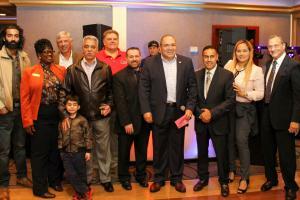 PERTH AMBOY, NEW JERSEY, US, January 23, 2019 /EINPresswire.com/ — Perth Amboy, New Jersey (January 23, 2019) –Business owners, company executives and professionals in Perth Amboy have an opportunity to shape the future of the city’s downtown by serving on the BID’s Board of Directors. The Business Improvement District (BID) is asking the owners of commercial properties and/or companies, which are located in the BID, to apply for one of the positions on the organization’s board. Also, executives at local businesses or professional service firms as well as leaders from not-for-profits groups in the business improvement district are encouraged to submit an application for the BID’s board. The BID’s directors, who are volunteers, pursue positive actions that help foster business activity and they serve the broader community. Applications for the BID’s board are available now. Candidates may obtain an application from the BID’s Executive Director Junel Hutchinson by calling 732-442-6421, sending an email to JHutchinson@PerthAmboynj.org or by visiting the office located on the first floor of City Hall. Completed applications, plus the applicant’s resume, are due back to the BID’s office on or before January 30, 2019. The current directors on the BID’s board represent a range of companies and business sectors. The board includes executives from commercial real estate, hospitality, banking, insurance, retail, early childhood education and travel companies as well as professionals from business services firms. Mayor Wilda Diaz also holds a seat on the BID’s board. BID has set specific requirements that each nominee needs to meet. Except for a one-year “at large” seat, all directors nominated and elected must be property owners, tenants or business owners operating at a property within the BID’s District. The property owned by the owner or leased by the tenant (as the case may be) who is an applicant must be in good standing in terms of property taxes due to the city. Seats for directors also have different terms of length of service on the Board. For more details about the application or nominating process and the specific criteria set forth in the BID’s By-Laws about who may serve on the BID board as well as a director’s responsibilities and commitments, contact Mr. Rosengarten or Ms. Hutchinson. Each application will be reviewed by the BID’s Executive Committee that includes Chairman Rosengarten, Vice Chairman Sergio Diaz, Treasurer Reyes Ortega and Secretary Jeanette Rios. After reviewing the applications, the executive committee makes recommendations to the full BID board about who should be nominated. Next, the BID board decides by a majority vote who should be nominated and thereafter an election is held by ballot at the BID’s Annual Meeting, which has been scheduled for February 28, 2019 at 4 pm. 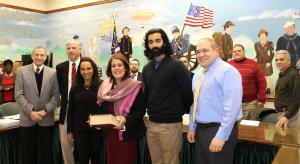 The Perth Amboy BID is a non-profit corporation authorized by the City through a statute. The BID is funded by a special property tax assessment within the BID’s District. The BID serves local businesses, property owners, the community and visitors by scheduling and presenting a year-long schedule of special events. The programs include business seminars, skill-building programs for employees, and such festivals as the Taste of Perth Amboy. The BID also provides façade grants to small businesses that make permanent improvements to their storefronts or buildings. In addition, the organization helps maintain and enhance the city’s streetscapes by installing information kiosks, planters and directional signs as well as seasonal decorations.